Hey there this is Travis with the first part of a CRAZY series of articles. Why are they crazy? Well first off you’d have to be CRAZY to bring these decks to any tournament. Also, they’re just CRAZY fun to play. As if that weren’t crazy enough, I’ll be doing the entire deck analysis in a step-by-step format! Step 1: Get Some Lizards! Your main attacker will be Kecleon from RR. At first glance you’ll see an attack that does a base of 10 and a max of 70, which isn’t very impressive. Count that with the fact that the attack costs three energy, and requires three coin flips sounds downright… CRAZY! Why is this Pokémon the main attacker? Well it’s because of his Body. This guy is so crazy that he is every type at once. Now stop and think of any Pokémon with a weakness. Kecleon hits that Pokémon for weakness. I wish it were that simple, but unfortunately, Pokémon these days don’t all have x2 weakness. On top of that, Kecleon hits for everyone’s resistance too. Before we can go any farther with Kecleon’s damage output, we have to make sure we’re hitting for x2 weakness, and no resistance. X2 Weakness is a double edged sword though so we’ll have to get rid of Kecleon’s weakness too. 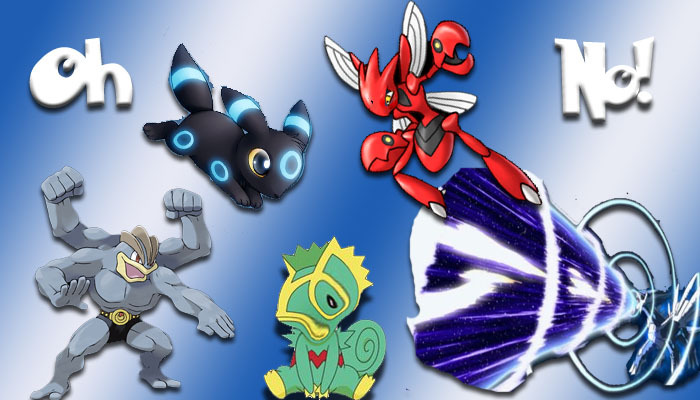 The obvious solution to the x2 weakness issue is Lucario GL. His Body makes all Pokémon’s weakness x2. Lucario GL is needed, as well as a less obvious stadium to handle the other problems. Sunyshore City Gym removes all Lightning types weakness, as well as removes the resistance from any Pokémon being attacked by a Lightning type. 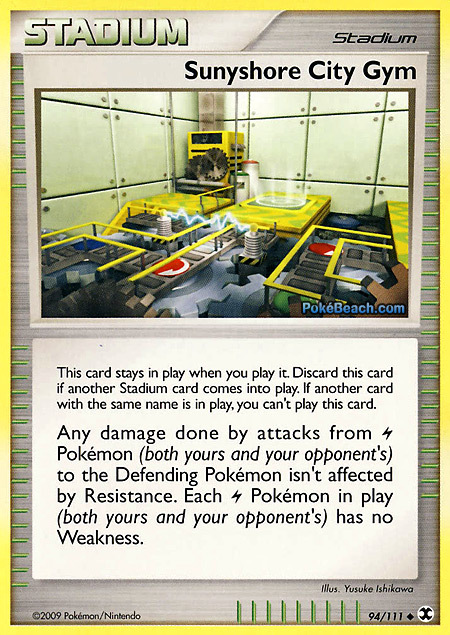 Because Kecleon is technically Lightning type, this stadium will remove Kecleon’s Fighting weakness, and prevent resistance from being applied for his attacks. Now we’re hitting everything with a weakness for 2x and no resistance. Let’s start working with this. Now that we have the first system up, we need to start working on the base damage for his attack. Expert belt will bring Kecleon to base 30. The energy you’ll be using in the deck include Special Dark, Special Metal, and Double Colorless. With at least one Special Dark the base is now 40. The other alternatives are Cherrim SF and PlusPower, both of which will raise the base damage by 10. With these things combined, it’s not uncommon for a Kecleon to reach a base damage of 50 or 60, which means with the system in place, we’re doing 100 or 120 damage before we even flip the coins. The coin flips are the best part. Each one adds 20 base damage for a total of 40 additional damage per coin flip. That’s CRAZY! Regardless of how sweet this lizard is now, he can still be Ko’d pretty easily. Shaymin Lv.X is a nice way to give him +40 HP, but instead of preventing him from being knocked out, why not just add a system to refresh a fully loaded Kecleon every turn? That would be CRAZY! Let’s start off with Floatzel GL Lv.X. 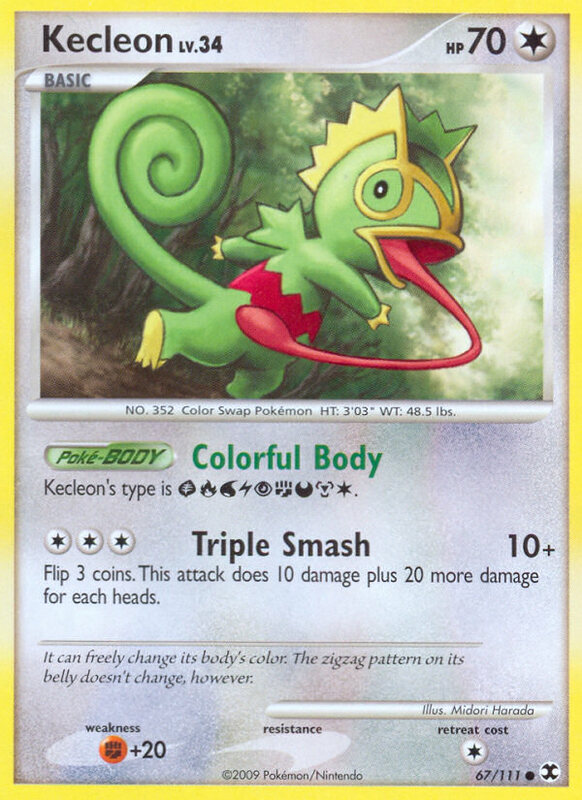 With this Pokémon, Kecleon and all cards attached to him will return to your hand when Kecleon is knocked out. When this happens, promote Floatzel GL, play the Kecleon back down, and free retreat Floatzel G for the Kecleon. What’s that? His attack costs three and you can only play one energy per turn? This is the hardest problem to deal with in the deck, and the best solution available is Leafeon Lv.X. His Poké-Power allows you to attach an extra energy per turn. Use this to attach a DCE and a Dark or Metal. With this system in place, you’ll have a fresh, reloaded Kecleon every time it is knocked out. The deck relies on quite a few Pokémon to function, and has two different systems needed to work correctly. The deck also finds itself short on bench space, so there is little room to work with. Uxies, Collectors, Communications, and Level Maxes are all suggested, as well as the cards mentioned above. So let’s put all of this together into a basic list. There leaves 10 spots in the list, and I’m sure there will be some disagreement with it. I Suggest the other 10 cards be helpful Trainers like Warp Points or PONT. The basic idea should be clear though. There are obviously some decks that will just shut this down so bad it won’t even be fun. Four decks off the top of my head are: DialgaChomp, Umbreon, Machamp, and Scizor Prime. All of these decks shut Kecleon down in their own unique, unstoppable way. Meta aside, this deck is just crazy when it gets rolling though. I have done over 200 damage with one attack, but it takes some work. Point is, if you have some Kecleons, and some special Energy somewhere, and if you’re looking to change the game up and have some fun without worrying about the meta, give this deck a try. If you’re skilled enough to set up all 6 different Pokémon, this deck will blow your opponents mind. Maybe even drive them… Crazy. I used to play this deck with Darkrai Lv. X and Togekiss GE to mass attach some basic dark energy. I also used the above-mentioned Shaymin, but hadn’t thought about floatzel or leafeon. I find they’re not as useful because you can just set up more than one kekleon at once. I like the idea, but I don’t think leafeon and floatzel are the way to go. They seem like they will be just as slow as manually building up a Kecleon. Kecleon is usually being KOd every turn after a certain point. It’s completely necessary to have those two imo. 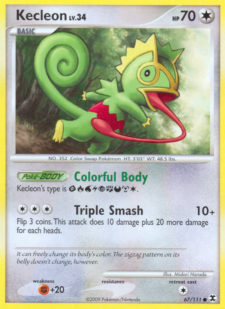 If you have a Kecleon knocked out with no energy acceleration, you put him down, give him an energy and end your turn. It’s like giving your opponent another prize when Keleon is KOd making the game even more tricky. 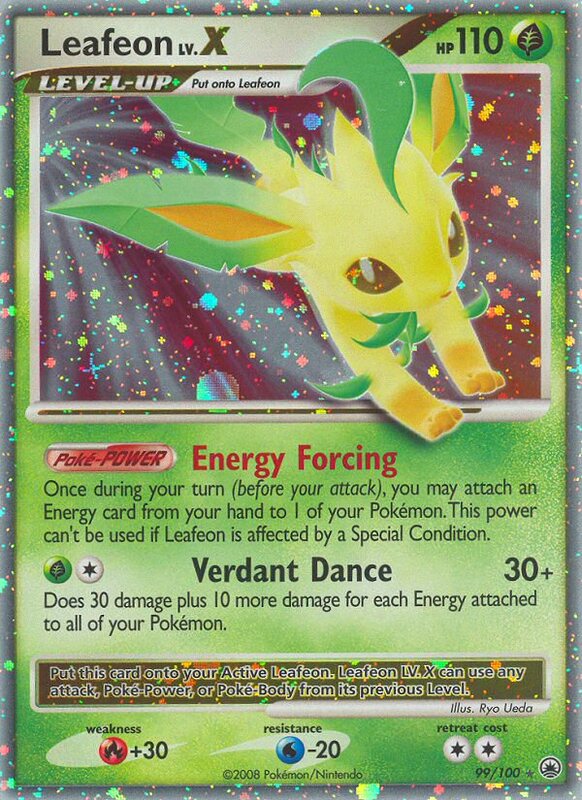 Leafeon is the only way to attach more than one special energy a turn (reliably) Floatzel is a beast. Easy to set up, free retreat, and you don’t loose any Kecleons, energy, or expert belts while he’s out. He makes it so you don’t need any deck refresh. Point is, it takes a long time to get Floatzel and Leafeon out, but getting them out guarantees infinate Kecleons for the durration of the game. If you start with a couple level maxes, it’s actually not very tricky. cool! im gonna make a deck like this too!